I think I’ve told you before that I love food52 (the blog). They have some really good recipes and interesting articles on food in general. They send out emails from time to time with featured recipes. 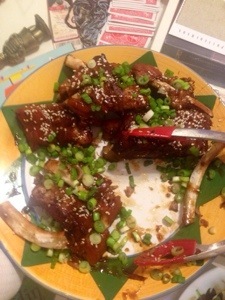 Yesterday morning they sent out the recipe for these Chinese honey hoisin sticky ribs and immediately I knew what I was making for dinner. I had to invest in things like oyster sauce and hoisin sauce so that made this meal a little expensive. However, I’ll definitely use those things again so it’s ok. I’m not sure how easy it would be for you to find this stuff; although, from what I remember there were a lot of Asian markets in Paris. 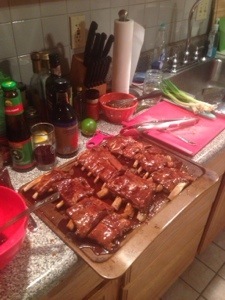 The ribs were really easy although a little time consuming (what ribs aren’t?). They were a HUGE hit. So good. 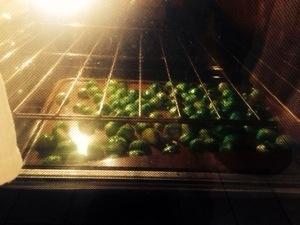 To accompany the ribs, I made the momofuku brussel sprouts. I couldn’t find Thai chiles so I used Serrano chiles. I’m sure you could use jalapeños too, it just wouldn’t be as spicy. Since I was making these for a crowd, I just decided to roast them instead of frying them. Next time, I’ll try to fry them. These were also SO good and so easy. 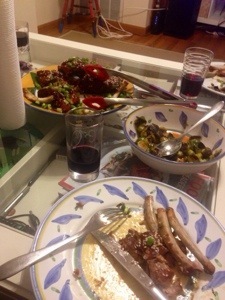 This entry was posted in weekend and tagged brussel sprouts, chinese, good for group, momofuku, ribs. Bookmark the permalink.